The Buffalo Sabres are currently the best NHL team in New York, and that shouldn’t come as a surprise. As a New York state resident, even I often forget that the Buffalo Sabres are part of the trifecta of hockey teams the Empire State is home to. When discussing New York’s hockey teams, it seems that there’s this unspoken hierarchy: the Rangers are the best, the Islanders are mediocre at best, and the Sabres sit at the bottom of the league and wait for their rebuild to finally end. In theory, this makes sense: between 2006 and 2017, the Rangers have had the most consistent play out of all three teams. They have made it to the postseason all but once in that 11-year span, making it to the second round seven times. In that period of time, the team has also made it to the Eastern Conference finals three times and the Stanley Cup Finals once, facing a 3-2 defeat by the Los Angeles Kings. The Islanders, on the other hand, have had much more trouble making consistent playoff runs. In their past 10 seasons, the team has only qualified for postseason play three times and has made it past the quarterfinal round once, when the team lost 4-1 to the Tampa Bay Lightning. Despite repeatedly having talented young players on their roster, the team has struggled with underperformance, making this past decade a forgettable one for the Islanders franchise. Finally, we reach the Buffalo Sabres. The Rangers’ and Islanders’ upstate neighbor has done nothing but struggle for the past decade. Their only two playoff appearances in this 10-year span were a pair of first-round losses in 2010 and 2011. Since 2011, the team has placed last in its division in all but three seasons, causing many to desperately ask what could possibly be done to save this franchise from a lifetime in last place. So, for many, it’s surprising to see that if the regular season were to end today, Buffalo would have the second wild card spot, sending the team to the playoffs for the first time in eight years. In reality, it should be no surprise that the Sabres are outshining their New York counterparts. The Rangers are coming off of the heels of one of their worst seasons in recent years and are currently trying to do damage control with the start of a rebuild that included hiring new head coach David Quinn and trading captain Ryan McDonagh as well as forwards J.T. Miller and Rick Nash. With all of this change, of course the team is going to struggle to get back on its feet. After placing sixth in their division and then losing captain John Tavares to the Toronto Maple Leafs during free agency, the Islanders made some questionable offseason moves. The team signed a handful of forwards that probably won’t be able to fill the Tavares-size hole left and did not sign any big-name players to try and fix their problem areas. 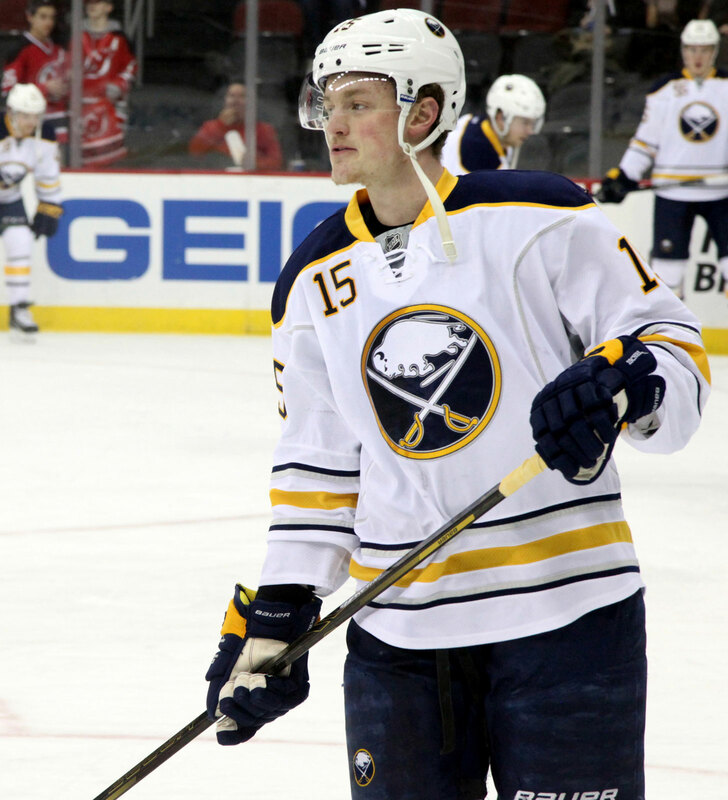 The offseason for the Sabres showed much more promise for the team. Buffalo signed first overall draft pick defenseman Rasmus Dahlin to an entry-level contract. The team also signed forwards Jeff Skinner and Conor Sheary, two players who bring their experience to a young Buffalo roster, and traded forward Ryan O’Reilly to the St. Louis Blues for a handful of players that included forwards Patrik Berglund, Vladimir Sobotka, Tage Thompson and two draft picks. These players are added to the young talent Buffalo has already worked to acquire in previous years (think second overall draft pick Jack Eichel), so it’s no wonder the team is finally doing well this season. Each year feels like another “this could be their year” season for Buffalo. The team makes moves that have the potential to lift them from the bottom, but they ultimately end up falling flat by the end of the season each time. After making a few big offseason acquisitions, the Sabres are finally meshing well and producing positive results for the team. They have the talent, and that talent is finally, as a unit, finding success. I wouldn’t be surprised if this could actually be the year Buffalo snaps its eight-year playoff drought.